From the drawing boards of Amsterdam-based design studio Van Geest Design comes this 60 metre fast motor yacht. Designed to a client brief for a fast, performance-oriented and sporty-looking motor yacht, the concept has a graphic profile created by the striking silver hull, which cuts away to reveal the charcoal-coloured glazed superstructure, while the yacht's straight stem with shallow forefoot is promising for performance. 'The goal is speed, but also engine efficiency,' says designer Pieter van Geest, who has envisaged a top speed of 24 knots for the yacht, which he describes as 'aggressive but sophisticated in appearance'. However, there is more testing to be done before the propulsion system and engines are specified. The yacht is laid out to accommodate 12 guests and 13 crew with the extensive owner's suite situated forward on the main deck comprising an office, bedroom and en suite bathroom. The remaining five guest cabins, one of which is a full width VIP, are located amidships on the lower deck, while the crew quarters are forward along with the spacious service areas. From here there is access to the lower tank deck where cold rooms, additional service areas and storage areas are located. For a yacht that is designed around socialising, entertaining and relaxing with friends and family, the alfresco deck areas are all-important, starting with the sun deck, which has a sun lounge, rotating sun-bathing platforms, spa pool, barbecue and sushi bar. The forward bridge deck and aft decks also have seating and sunbathing areas. Inside there is an large main deck saloon and bar, and an upper saloon and dining area on the bridge deck. On the lower deck a lazarette stores a 9 metre tender and toys, while the crew tender will be stowed in the bow and launched by crane via a top hatch. 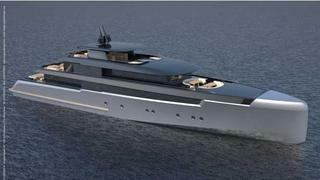 More details of the yacht will be released in the course of 2012. Van Geest Design has just celebrated its fifth year milestone, although both members of its team have been in the superyacht industry for considerably longer. Pieter van Geest cut his teeth at Ron Holland Design and Trintella Shipyard while studying and has in the last decade worked with several yacht builders and designers such as René van der Velden, Ron Holland and Frans Maas on the design, drawing, construction and engineering planning of both production and custom yachts. Tracey-Jayne Canavaggio is a furniture designer by training and started designing interiors for yachts at Ron Holland Design, where she worked on a range of superyachts from Boo Too to Mirabella V. She then moved on to Francis Design, Hoek Design and Rémi Tessier, where she worked on both interior design and exterior styling for sailing yachts up to 60 metres and motor yachts up to 95 metres, before recently joining Van Geest Design.